Test Your Manual Dispenser – Harper Inc.
Dispensers are precision equipment designed to dispense tiny amounts of concentrated colorant into your bases to create a nearly unlimited range of colors for your customers. Companies that make colorants work to ensure that their colorant strengths are the same from batch to batch. This ensures that you have a perfect reproduction of color regardless of what batch the retailer is making paint in. The last link in the chain of accurate color reproduction is your dispenser. Many stores rarely replace or repair their dispensers. Often, dispensers are over a decade old (or older!) with little or no maintenance and almost never being tested for accuracy. While dispensers are designed to give you years of worry free results, older units and dispensers that are not maintained can be costing you wasted colorant, mis-tinted paint and ultimately, customers. That is why we have developed an easy test to use to see if your dispenser is delivering the accuracy that your colorants deserve! 12 - 16 Small clear graduated containers with at least 1 ounce markings If you cannot find any that meet this requirement there are some on amazon that work great! Move the plunger up and down to fill and flush the cylinder several times. Once again, move the plunger up and down several times to recycle the colorant in the valve. Check to ensure that you now have 1 ounce in your container. *Repeat steps 1-8 for each canister on your dispenser. *Be sure to use a new cup each time you change canisters. *Note the variance for each canister in your note pad. *IMPORTANT! 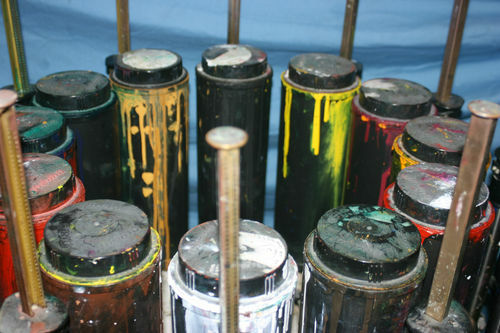 Pour the colorant back into the canister after testing each canister. Some colorants dry extremely fast. IF your findings are off by more than a few tick marks on the cup, it may be time to service your machine or to think about a new solution for your dispensing needs. If your findings are right on, or very near the 1 ounce line on the cup your machine is ready to provide you with accurate and repeatable results! I hope that this test was easy to do and that you find your system is in peak condition. If you did not get the consistent results needed to ensure quality color, please contact us as soon as possible to find out what your options are for repair or replacement of your dispenser. Give us a call at (888) 884-4313 for more information! Did you test your dispenser? If so let us know how the test went and your findings in the comments below. Thank you for this test! my dispenser was off on my yellow oxide by almost 1/8 of an ounce and i had no idea why many of my blue/green colors were inconsistant. i will be calling you today about repair options. This process took me a while but was deff. worth my time. i found that 2 of my canisters were way off!!! C and KX are needing real attention and the rest are no worries! This test showed me that my tint machine is working great. Thanks for the test! I guess my matches are off for some other reason. Your test is off. the 1/48 only dispenses 46/48. The 1/32 dispenses 34/32. the numbers are switched on the first step. Yes they were! thank you for pointing this out. we have corrected the article. You are absolutely right! Thank you! We have corrected the article.